It's that time if year again! Christmas music, holiday cheer, shopping for that perfect gift, and UGLY SWEATERS! 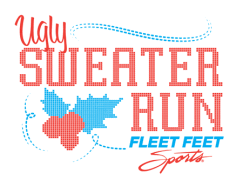 Suit up in your best holiday get-up or ugliest sweater, and join Fleet Feet Rockford for a festive Ugly Sweater Run through downtown Rockford. We will meet at Vintage@501 and run a 3 mile fun run through beautifully lighted and decorated downtown Rockford. A prize will be awarded for the ugliest sweater. All fitness levels are welcome. Please make sure to wear lights and reflective gear for your safety. Vintage@501 will be offering drink specials after the run for those who want to stick around. Please arrive early to check in and sign the waiver.